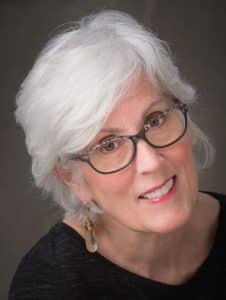 About Dr. Marshack – Kathy J. Marshack, Ph.D.
By Kathy J. Marshack, Ph.D.
My credentials go back decades including a Master’s Degree in Social Work, and a Doctorate in Psychology. I’ve worked in every conceivable professional setting from child protective services, home health agencies, public schools, colleges, hospitals, and mental health clinics. I’ve covered lots of territory in those years, as you can imagine; everything from working with young children, teens, couples, families, seniors, and entrepreneurs; and with every conceivable diagnosis. I’ve trained with the best too. I am certified in these specific clinical techniques including Cognitive Behavioral Therapy (CBT), Neuro-Linguistic Programming (NLP), Ericksonian Hypnosis and Neuro-Emotional Technique (NET). I find these techniques incredibly powerful in creating elegant and long-lasting healing and change. To learn more about these approaches go to Therapy Techniques. But as valuable as my education, training and experience is, I also know that each one of you is as unique and special as your fingerprints. Did you know that no one on the planet shares your fingerprints? That’s right. What this means is that as your psychologist I have to pay attention to who you really are, so that together we can design a plan that works just for you, and your loved ones. When I discovered this simple premise, I realized that no matter how Complex your relationship, there is help. It’s a matter of listening—listening with my heart and my head—and trusting that together we can co-create the changes you need and want to make. Then there is one more thing I want you to know about me. I can relate personally to every single one of the Complex Relationship bullet points listed above. I was raised by a High Functioning Autistic mother, and an alcoholic father. My eldest daughter is on the Autism Spectrum. I’ve been an entrepreneur for many, many years, and raised my children in this environment. I too went through a hostile divorce, including parental alienation. Finally, I was motivated to write my latest book, WHEN EMPATHY FAILS How to stop those hell-bent on destroying you, because I found myself in a 12 year property dispute with neighbors, the police, and government officials, who tried to destroy my career, my finances and my family. 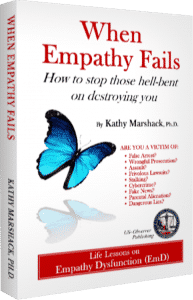 Out of this experience, I developed the Empathy Dysfunction Scale (EmD). Just like you, I went through a lot of suffering before it occurred to me to take another approach. I learned to build resilience. I learned to use what I know as a psychologist to reshape the outcome. I counted on the principle that Michelle Obama champions, “When they go low, we go high.” This doesn’t mean that you don’t get hurt, or angry during all of those trying times. What it means is that when you’re up against the harshness of a complex relationship, “your response has to reflect the solution,” according to our former First Lady. I call this response, Radiant Empathy (EmD-5 on my scale). That’s the goal of therapy with Dr. Marshack, Radiant Empathy. Life isn’t perfect, and you will keep making mistakes. But with Radiant Empathy you will learn to use your mistakes as feedback to refashion your life for greater healing, love and happiness. I hope to hear from you. You are not alone. Your voice matters. I am here to help you.